2. Assertion (I) : An encyclopaedic dictionary provides detailed information about a field of knowledge. Assertion (II) : All comprehensive dictionaries are encyclopaedic dictionaries. 3. 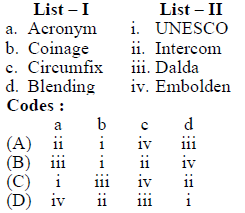 Which of the following treatises is known for its Indian traditional theory of ‘Rasa’ ? 10. Assertion (I) : It is believed that retroflexion developed in Indo- Aryan spontaneously in the environment of /r/ and retroflex vowels, and went through rapid diffusion as a result of contact with Dravadian languages. Assertion (II) : Retroflex sounds however do not occur in Garo, Khasi and Assamese. 12. Assertion (I) : In the continuum of cross linguistic similarity relationships, three distinct types can be discerned; similarity, contrast and zero relations. 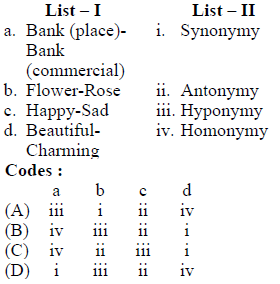 Assertion (II) : The similarity relation means that an item or pattern in the target language (TL) is perceived as functionally similar to a form in the L1. 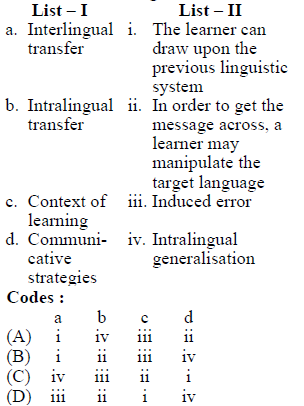 15. Who is/are the author(s) of the book entitled ‘Introducing Applied Linguistics’ ? 16. Assertion (I) : The concept of modularity is important in psycholinguistics. Assertion (II) : Most people agree that processing can be described in terms of single level of processing. 25. Assertion (I) : Ferguson sees three categories of language development : graphization, standardization and modernization. 28. Assertion (I) : Borrowing is a term used in comparative and historical linguistics to refer to a linguistic form taken over by one language or dialect from another. Assertion (II) : Borrowed words are not considered as loan words. 32. Assertion (I) : Semiotics is the scientific study of the properties of signalling systems whether natural or artificial. Assertion (II) : The term synonymy is used in semantics to refer to a major type of sense relation between lexical items. 33. “The tornado annihilated the whole town to the point that nothing was left standing”. What does annihilated mean ? 39. 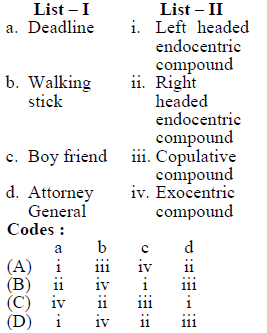 Which ones of the following are ECM verbs ? 40. Assertion (I) : A verb can assign case only if it assigns an external theta-role. Assertion (II) : Because verb fall assigns external theta-role, it can also assign case. 45. Assertion (I) : In the articulation of [S] in the English word ‘sweet’ there is anticipatory coarticulation. Assertion (II) : In the articulation of [S] in the English word ‘sweet’ there is double articulation. 48. Assertion (I) : Feeling order is that in which the output of one rule increases the number of items to which the second rule can apply. Assertion (II) : Bleeding order is that in which the output of the first rule decreases the number of items to which the second rule is applicable. 49. Assertion (I) : Lexical rules must be structure-preserving and apply first. Assertion (II) : Post-lexical rules are also structure-preserving and apply only later. 50. 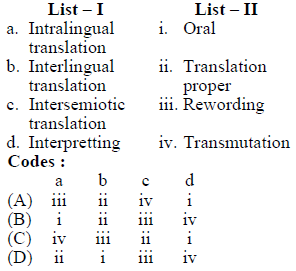 Assertion (I) : Computational linguistics analyses natural languages on the basis of the internet features such as rules and representations of natural languages. 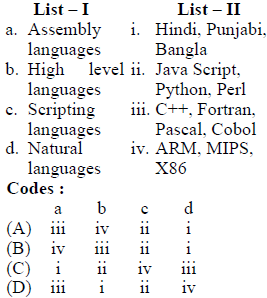 programmed well in computer languages. 51. 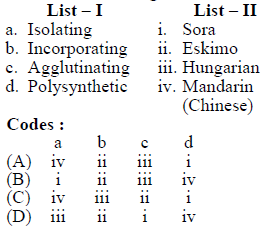 Assertion (I) : Morphological typology classifies languages of the world on the basis of how much and what kinds of morphemes are used in the languages. Assertion (II) : Despite the best effort and rigorous training morphological typology can’t classify languages into water tight compartments. (B) it processes information contained into hardwares of the computer. (A) a computer program that receives sequential information and breaks it up into nonsequential parts. 57. 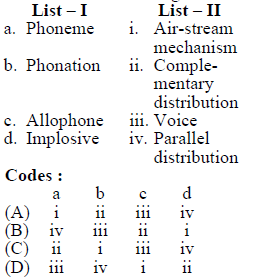 Assertion (I) : A phonematic unit is associated with a single position in a linear structure. Assertion (II) : A prosody is that whose domain is potentially larger. 60. Assertion (I) : Autosegmental phonology allows phonological processes to be independent and extend beyond individual consonants and vowels. 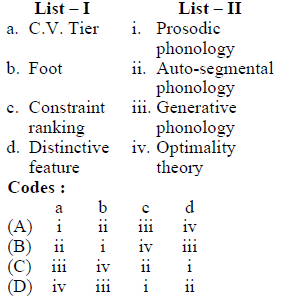 Assertion (II) : In autosegmental phonology each tier is not linked to the other by association lines. 61. Assertion (I) : There can be differences between the words used by men and women in a variety of languages. Assertion (II) : An alternative that includes both genders, or avoid gendered usage is becoming more common in modern languages. 63. 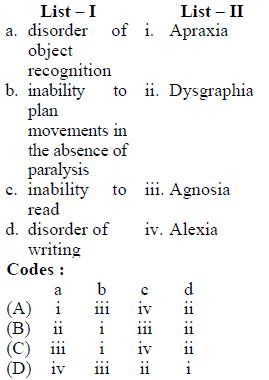 Which of the following is stigmatized variety of English ? 66. Which transformation does the derivation of the sentence ‘He works hard’ involve ? 68. 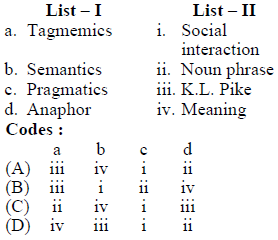 Assertion (I) : Functional categories like determiners, propositions and models lack lexical content. 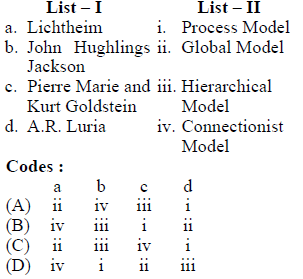 Assertion (II) : A functional category may assign case. 69. Assertion (I) : Minimalist program emphasizes the aim of making statement about language as simple and general as possible. 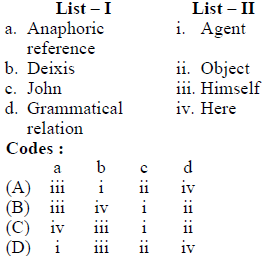 Assertion (II) : Deep structure is the abstract syntactic representation of a sentence. 71. Assertion (I) : The left hemisphere, typically better at ‘analytic and temporal activities’. Assertion (II) : The right hemisphere, typically better at ‘intuitive and holistic activities’. 74. 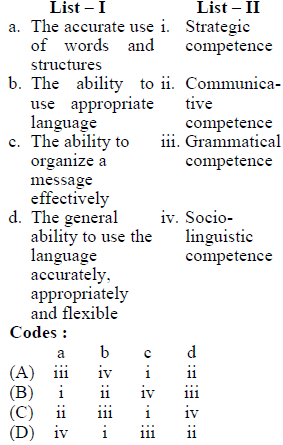 Assertion (I) : Hypothesized by Chomsky ‘Language acquisition device’ is more commonly known as universal grammar.